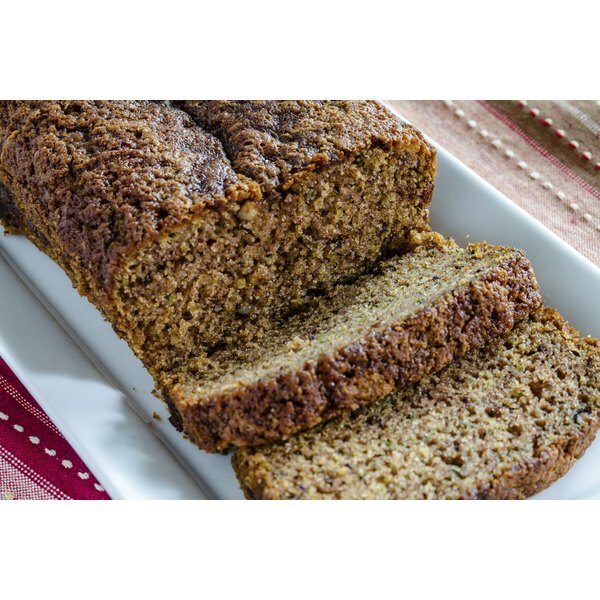 Freshly baked zucchini bread with fuzzy squash sits sliced on a white plate. Fuzzy squash, also known as mo gwa, fuzzy melon, hairy cucumber or hairy melon, is aptly named for the fine-textured fuzz that covers the outer covering. The mild, sweet-flavored squash, which is common to Asian cooking, is low in calories and high in fiber. The squash is easy to prepare and is incorporated into a variety of cooked dishes. Select solid squash with no bruises or soft spots. Squash weighing 1 pound or less taste better than larger squash, which tend to become tough and flavorless. Rinse the squash thoroughly under cool running water. Trim the stem and blossom ends with a paring knife. Remove the fuzz from young, tender squash by scraping off the outer covering with the back of a paring knife. Leave as much skin as possible to retain nutrients. Peel older squash, which has tougher skin. Grate the squash and use it in zucchini bread, muffin or cake recipes. Add grated squash to spaghetti or pasta sauce. Cut ripe fuzzy squash into thin slices. Add the slices to a wok or skillet, then stir-fry it in a small amount of oil with sliced vegetables or chopped chicken or fish. Saute sliced squash in a skillet with additional vegetables. For example, saute an onion or shallot and a garlic clove, then add the squash slices with chopped tomatoes, mushrooms or summer squash, such as yellow squash or zucchini. Add chopped squash to your favorite casserole recipe, as the squash blends well with cheese, meat and pasta. Make a simple vegetable bake with chopped fuzzy squash, tomatoes and onions. Top the dish with toasted breadcrumbs and grated Parmesan cheese. Mix slices of fuzzy squash with a chopped onion, then flavor the dish with a bit of lemon juice, salt and pepper, and seasonings such as marjoram and cayenne pepper. Microwave the mixture on high until the squash is tender, then sprinkle the top with toasted almonds. Cut fuzzy squash in chunks and add them to soups and stews.